The time period covering Predynastic Egypt is 5550 BC - 3050 BC. Between 5500 and 3100 BC, during Egypt's Predynastic Period, small settlements flourished along the Nile. By 3300 BC, just before the first Egyptian dynasty, Egypt was divided into two kingdoms, known as Upper Egypt (Ta Shemau) and Lower Egypt (Ta Mehu). Little is known about the dynasties spanning the Predynastic period. 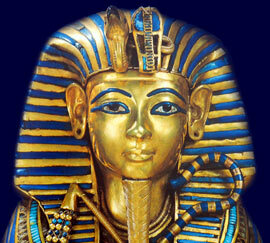 This time is also referred to as Protodynastic Period of Egypt - Dynasty 0. The known names of the Pharaohs who ruled during these dynasties of the Predynastic period are detailed below. Our Egyptian Timelines provide a time driven list Ancient Egyptian pharaohs, periods, kingdoms and dynasties provide the generally accepted dates of each of these times - a chronology or list of dates of all the periods, kingdoms and dynasties of Egypt. So if you are interested in the Predynastic period then the important people and events, via a simple timeline, charting the key dates in Ancient Egyptian history will prove to be interesting.